“Pilot whale rescue attempt”. BMMRO’s team and local volunteers helped to hold the pilot whale upright in the water so that it doesn’t drown while keep a watchful eye out for sharks. 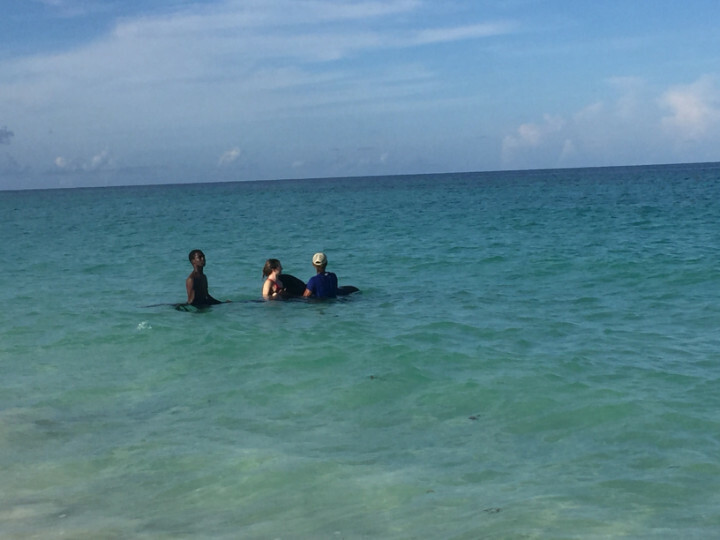 Abaco, Bahamas - The Bahamas Marine Mammal Research Organisation (BMMRO) responded to the report of a live stranded pilot whale on August 23rd on the beach just north of Crossing Rocks, Abaco. With the help of Crossing Rocks community members, BMMRO’s team was able to push the 11-foot young adult female whale back out to sea but had to hold it upright so that it did not drown. Two sharks patrolled nearby. During the rescue, BMMRO scientist Dr. Diane Claridge discovered a 3-foot long and 3-inch deep cut on the whale’s underside, deep enough to have cut into the muscle. “Dead pilot whale showing cut into muscle”. 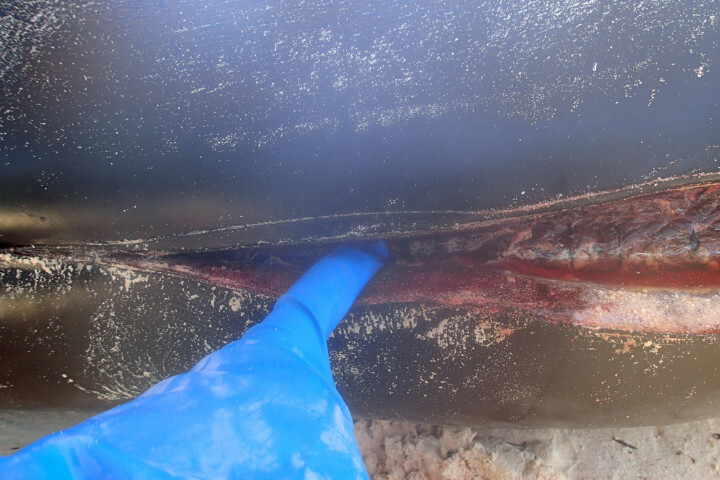 After the whale died, BMMRO scientists conducted a full necropsy, including documenting that the laceration was deep enough to extend into the whale’s muscle. It is against the law to harm marine mammals in any way in The Bahamas. Anyone with information regarding who conducted this despicable act should contact the Department of Marine Resources or Marsh Harbour Police immediately. “Alive pilot whale with 3ft long cut”. This photograph was taken when the 3-foot long cut was discovered. The whale was alive at the time the mutilation occurred. Ambergris is a substance that sperm whales produce in the stomach to help digest and pass squid beaks. Only sperm whales produce ambergris and not all sperm whales, and no dolphins or any other whale species. Sperm whales defecate the ambergris with the encased squid beaks (occasionally it is vomited instead) and the ambergris floats at sea until is it washed ashore. During its time at sea and on the shore, its chemical properties change due to oxidation. Ambergris is highly valued for its use in the perfume industry, but only after it has oxidised. Ambergris in the stomach or intestines of a dead sperm whale is worth absolutely nothing (and smells awful). Furthermore, a whale’s stomach is not located on its underside but under the ribcage. Mutilating a whale or dolphin is not going to result in finding ambergris of any value but could result in a $5,000 - $25,000 fine and/or up to 18 months in prison. The appropriate response when someone discovers a stranded dolphin or whale whether alive or dead is to immediately call the Bahamas Marine Mammal Stranding Network (242 366-4155) to initiate the stranding response team. This network consists of 130 members located throughout The Bahamas. Assisting a living whale or dolphin should be done with caution (because they are large animals and may transfer diseases) but helping the animal to breathe and keeping it wet until experts arrive will sometimes save its life. 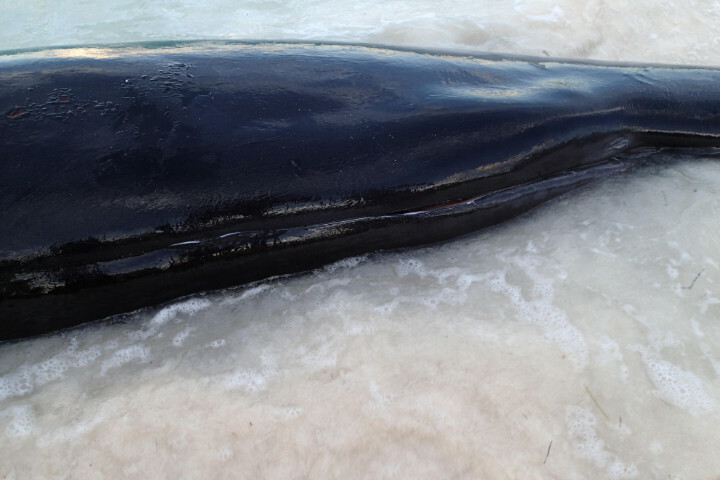 Despite our efforts to save the pilot whale, she died the following morning. 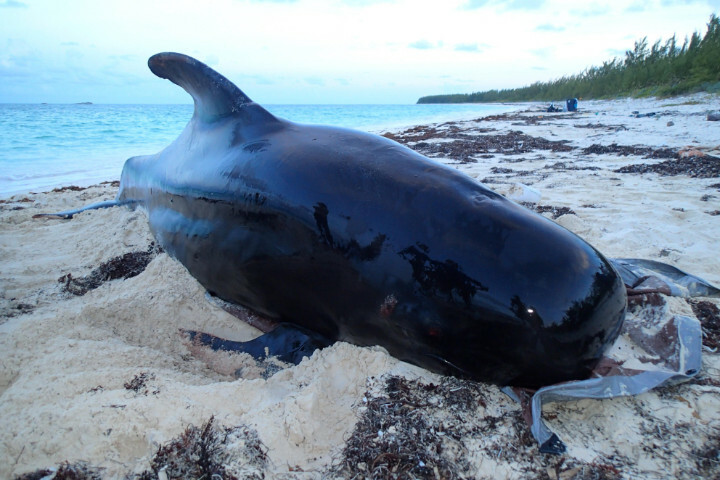 BMMRO conducted a necropsy (an animal autopsy) and samples were collected to determine the initial cause of stranding. “Pilot whale laid to rest”. After efforts to save the animal were unsuccessful, the young adult female pilot whale was laid to rest here on the beach. BMMRO wishes to thank all those individuals from the Crossing Rocks community who came out to help, especially Marcus, Tony, CJ, DeShawn and Antoine; Olivia, Cha, and Dr Bailey from Marsh Harbour, and our interns Ashley and Krystynia. The Bahamas Marine Mammal Research Organisation (BMMRO) is a non-profit group based in Sandy Point, Abaco whose mission is to promote the conservation of marine mammals through scientific research and educational outreach. To learn more about BMMRO’s research and its outreach programmes, see the following links: www.bahamaswhales.org, and www.facebook.com/bmmro.